American Veterinary Dental College (AVDC): This site lists all members and provides excellent information for clients and veterinarians. Members of this college are recognized as specialists. Dr. Kressin is an AVDC member. Academy of Veterinary Dentistry (AVD): This is an international organization of individuals dedicated to the clinical and research aspects of veterinary dentistry and oral surgery. Members are called "fellows". Dr. Kressin is the only Wisconsin member of the Academy (FAVD). Academy of Veterinary Dental Technicians: Organization of technicians dedicated to veterinary dentistry. Veterinary Oral Health Council: This site offers products proven to be effective in helping control periodontal disease. American Veterinary Dental Society: Organization of veterinarians interested in the promotion of dental awareness. Dr. Kressin is a member of this society. He encourages all veterinarians interested in dentistry to join this organization dedicated to dental education. Journal of Veterinary Dentistry: Official journal of dentistry and oral surgery recognized world wide. Dr. Kressin is a reviewer of articles submitted for publication in this journal. Pet Dental Health Month: Pets have teeth too. Devoted to an increase in pet dental awareness. Veterinary Radiology- A teleradiology site: Dr. Kressin is a reviewer of radiographs submitted for evaluation. Vet Dentists: A group of actively practicing veterinary dentists working as a team to help promote veterinary dentistry and oral surgery. Dr. Mike Peak: Tampa Bay, Fl area veterinary dentist. Dr. Chris Visser: Phoenix, AR area veterinary dental group. Dr. Bob Boyd: Houston,TX area veterinary dentist. 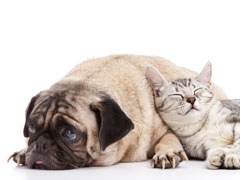 Animal Emergency Center: Milwaukee area emergency and specialty referral facility. Dr. Kressin provides dental consultations, clinical procedures and offers dental education at this facility. Dr. Brook Nemic: San Diego, CA area veterinary dentist. Dr. Tony Woodward: Colorado Springs, CO area veterinary dentist. Dr. Allen Matson: Kirkland, WA area veterinary dentist. Vetdentists.com: A group of veterinary dental specialists that work together to share ideas and improve skills. This site is a good starting point to learn more about a variety of topics, including feline injection-site sarcomas and the latest subjects in veterinary medicine. This organization is the governing body of the veterinary medical profession. The American Veterinary Medical Association defines the individuals that may be called specialists.